AUTISM ACADEMY – Special needs educators at the Autism Academy, a school for children with autism, located in Tempe,AZ, are using podcast, robotics, coding, typing, MobyMax, and computers to advance instructional objectives. Classroom technology at Autism Academy campuses encompass all kinds of tools, including PCI reading and math for students with special needs. The use of technology is expected to prepare students for the future. The term “technology” refers to advancement in the approaches used to solve problems or achieve a goal. “In addition, technology has the potential to help students overcome learning deficiencies,” said Tempe Autism Academy principal Jason Cross. “Students naturally gravitate to technology.” From video games to cellular phones and surface pads, children enjoy navigating tech tools. He says students with autism are no different from other kids – and when it comes to technology Cross argues that they are likely to be better suited. These attributes motivate him to help students with autism explore their extraordinary traits in technology. Cross says he earned his Bachelor’s degree in technology from Colorado Christian University. Afterward, he acquired his Master in School Administration and Curriculum and Instruction. His unique skillset is challenging staff and students to take an innovative approach toward teaching and learning. “Whenever we try to innovate a school you will have FUD,” Cross said. “But educators must remain forward thinking.” He says FUD is “fear, uncertainty, and doubt.” These emotions usually spiral from individuals who aren’t familiar with or intimidated by the use of technology. According to Autism Academy development director Shannon Mitchell, more technology is an innovative approach of increasing school services in our modern society. “Slowly increasing technology enables our students to do more research, collaborate on projects, and gather information quickly,” Mitchell said. “We want our students to learn the basics, so we are giving them exposure.” She says, technology is their future. The Autism Academy specializes on identifying strengths and weaknesses to help students transition beyond high school. In addition to technology, the Autism Academy in Tempe recently implemented the explorer program. This enables youth with special needs to explore various electives like cooking, coding, robotics, and much more. By widening students interests with our innovative teaching techniques we’re opening more doors for opportunity. 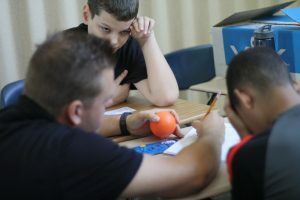 The Autism Academy is soaring above similar school with its cutting-edge strategies and a well-balanced curriculum that creates an organic connection within the culture it serves. To learn more about what our school is able to offer your child with autism, please contact us.